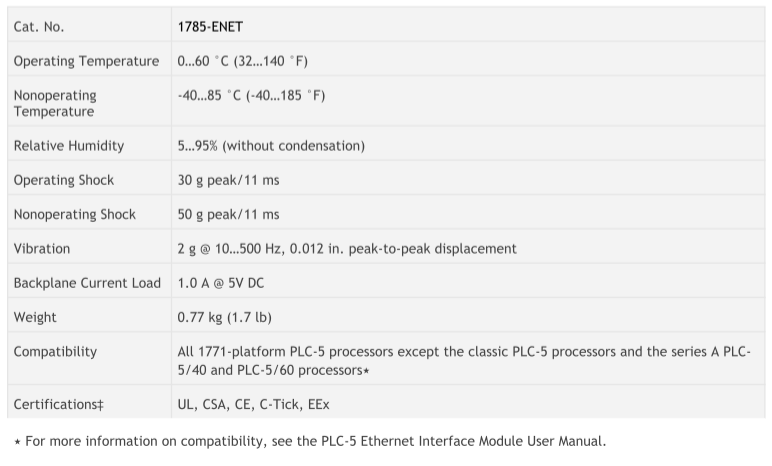 1758-ENET is an EtherNet/IP-Interface processor that gives the PLC-5 process an Ethernet port. This gives embedded TCP/IP communication abilities that allows the PLC-5 processor to talk with other Ethernet devices. This processor provides accessiblity to the world of Ethernet TCP/IP offering a flexible, option solution. This processor gives a second Ethernet port to a Ethernet PLC-5 processor, plugging into the side of the PLC-5 processor, using the first I/O module slot. 10/100 MB peer-to-peer auto communication using PLC-5 messaging with an Ethernet port. Through Rockwell Software RSLinx™ or INTERCHANGE Software in a computer, application programs can talk to the EtherNet/IP network and to PLC-5 processors with Ethernet ports. Local Programming with DH+ or RS-232 and DH+ or EtherNet/IP with Rockwell Software programming software. For network management it uses Standard Simple Network Management Protocol support. Allows commands of remote I/O pass-through. Uses ESMTP for Event driven e-mail messages which needs RSLogix 5 V7.0 or later). Direct connection to a CAT5 network cable with a RJ45 connector. Standard web browser lets Web Diagnostics and Module Information get access to information that is found in PLC-5 processor data table, which includes diagnostic details which requires RSLogix5, version 5.2 or later. You can create different Web User Provided Pages that allow custom data table information. This give the ability for anyone with internet access to view these pages on the PLC-5 processor, which can be either HTML pages containing images, text and data table or Custom Data Monitor pages that contain data table elements in table form. ⋆ For more information on compatibility, see the PLC-5 Ethernet Interface Module User Manual. ‡ When product is marked. See the Product Certification link at http://www.ab.com for Declarations of Conformity, Certificates, and other certification details.